Puerto Rico is a territory of the United States. Last year, the people of Puerto Rico voted on whether to become the 51st state in the Union, and the vast majority of voters said yes. There is currently a bill in Congress on whether they can become a state, and if so, how. Puerto Rico was also devastated by Hurricane Maria last year. News coverage made many Americans aware for the first time that Puerto Ricans are U.S. citizens. It’s a great time to study Puerto Rico! We offer three great lesson plans below. Explore Puerto Rico with Google Earth. The link takes you to a site where you can fly around without using Google Earth directly. If you have Google Earth on your classroom computer, use it so you can take advantage of all the features. Boriqua Kids has printable worksheets and quizzes on Puerto Rico’s geography, as well as a Fact Sheet that taught us some things. Statehood for Puerto Rico: You Decide is a research-based lesson plan from the First Ladies Library. Scholastic’s Carnival in Puerto Rico uses graphic organizers to explore Carnival in Puerto Rico and compare it with other countries’ celebrations. Check out our Mardi Gras lesson plans for more information. Juan Bobo Goes to Work: A Puerto Rican Folk Tale is a Foolish Jack story. Puerto Rico isn’t a book, but a clever economics-themed game set in Puerto Rico. Putamayo Presents Puerto Rico is a wonderful collection of Puerto Rican music. Puerto Rico is a beautiful island and a popular tourist destination. Have students “visit” Puerto Rico with Google Earth, using a travel guide like Lonely Planet Puerto Rico to learn more about the places they see. This can be pair work, group work, or individual work, depending on the number of computers available. If students are divided into groups, consider giving them specific topics assignments: outdoor fun, food, music, etc. Have each student or group of students create an itinerary for a visit to Puerto Rico. Get the class together to share what you’ve learned, creating a complete list of interesting information on the board or on Post-It notes. Sort all the points listed into a few categories. Use the categories to organize a brochure describing your class’s Puerto Rico tours. If students have been working individually, have them create their own individual brochures and make a bulletin board with them. Groups can create brochures too, or the entire class can make one bulletin-board sized brochure describing the perfect trip to the island. Make brochures with art supplies, or use the templates in Microsoft Word or Serif PagePlus for some tech practice. In 2012, the people of Puerto Rico held a plebiscite, a vote on the government of Puerto Rico (results given above). In 2017, they held another plebiscite. 97% of voters chose statehood. 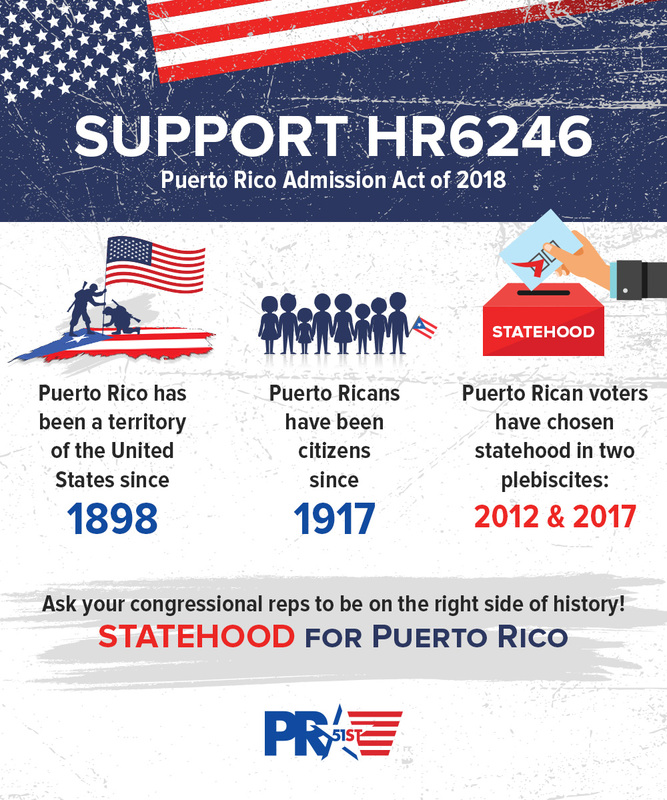 In 2018, the Puerto Rico Statehood Admission Act of 2018 was introduced in Congress. The voters of Puerto Rico chose to become a state. Now, Congress must approve their decision. Have students research and determine the best decision for Puerto Rico and the United States. The Puerto Rico Report has extensive coverage and documentation on the issue, from simple statements for upper elementary students to government documents for high school students. Start on the home page and travel in as far as your class’s reading levels will allow. Hold a class vote on whether or not Puerto Rico should become a state. Take on the role of Congress and decide whether or not to accept the Statehood Act on behalf of the American people. If your class passes the bill, plan a 51-star flag for the United States. 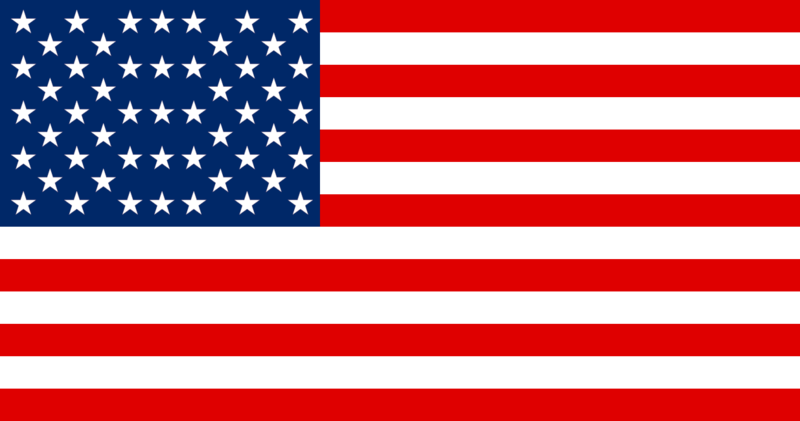 The current 50-star flag was designed by a high school student. He also designed a 51-star flag with alternating rows of 8 and 9 stars. Here’s a design by Daniel Rubino. If your class decides that Puerto Rico should continue to be a territory, discuss whether residents should be able to vote in presidential elections, or to have representatives in the U.S. Congress. Use books from the list above or online sources to find one or more Puerto Rican folktales to study. Have students use the folktale to create a play or readers theater script and present it to a neighboring class or create a video for the class to enjoy.